This tutorial contains some information about handling a Linux system. Ubuntu Linux is a full fledged Linux system trailed for the desktop. Ubuntu builds a unique user interface and offers the users a solid choice of tools. Unity is the default windows manager on Ubuntu. It introduced the launcher on the left side of Ubuntu and the Dash to start programs. Press the kbd:[Windows] key to start the Dash. Here you can type in commands to open programs and files. Ubuntu uses Nautilus as file explorer. Use the Dash or click on the icon in the task manager to start it. To be able to copy the current path, press kbd:[Ctrl + L]. To add new entries to the launcher you can create an .desktop file and drag the file on the launcher. To lock Eclipse to the launcher first create an eclipse.desktop file for Eclipse. Modify the icon and exec path to the the path where you installed Eclipse. select eclipse.desktop and drop it on the launcher or you can start Eclipse and then press Lock to Launcher on the Eclipse icon in the launcher. The following example creates an entry to start Eclipse with different shortcuts for different workspaces. The following lists a few useful shortcuts for the Unity window manager. To open a console open the 'Dash' and type in 'Terminal'. Alternatively you can use the shortcut kbd:[Ctrl, Alt, T]. This opens a console window which allows you to issue commands. Ubuntu offers several editors which are installed by default. The most common command line editor is vim. To install vim on your Ubuntu machine use the following command. Start vim from the command line. vim has two modes, one editing mode and other mode in which you can move within the file. The following demonstrates the usage of the find command. Finds all files which recursively apply to the pattern "pattern" starting from the directory "dir". The 2> sends all error messages to the null device. The find command can also be combined with the grep command. See Using the grep command. The following calculates the size (disk usage))of a folder "folder1" in megabyte. Use the command rm pattern to delete files. Be careful with the usage of this command. There is no way to undo deletions. To see all running processes on your system use the ps -aux command. Change recursively the owner and the group of the directory "mydir" and its subdirectories. You can create a soft link to a file or directory using the following command. To zip or unzip files on the command line you can use the following commands. To remove tailing whitespace from existing files you can use the following command. To create a new user via the console use the following commands. This creates the user, set his password and a home directory for the user. The -m parameter is responsible for creating the home directory of the user. You can create new user groups and add the user to the new group with the following command. Careful: The following command allows the user to execute sudo commands (root). # add admin rights to the user "newuser"
To change the default shell of the user to bash set the last entry of the corresponding user in the /usr/passwd file to /bin/bash. This is demonstrated in the following example. In case you need to create the home directory at a later stage you can use the following command which creates the home directory and change this ownership of the directory. To delete a user use the following command. # delete the user with the name "userName"
The PATH environment variable is where the system will look for executable files. To temporary add the /home/vogella/bin directory to the PATH use the following command. If you want to add a directory permanently to the path, you can edit / create the file .bashrc and add the following line to the file. Every new directory in the path must start with :. Open a new shell to make the changes in the .bashrc file active. On the command line Ubuntu allows to install / remove and search for packages via the following commands. Search for all packages which contain openjdk. The found package can get installed via the "apt-get install" command. Updates any installed packages for which an update is available. Will not install new packages or remove packages to satisfy dependencies. Install available updates for the Ubuntu release you already have installed. Also installs new packages or removes existing packages to satisfy dependencies. Updates the installation database and locates the javac command. To search for the installed packages use the following command. cat /var/log/dpkg.log | grep "\ install\ "
Shell scripts are short programs that are written in a shell programming language. They are interpreted by a shell process in the console. You can create these programs via a text editor and execute them in a terminal window. Bash Create for example the following text file. A bash shell scripts starts with "#! ", the so-called "shebang". You also have to make this file executable via: Create for example the following text file "yourScript". Now you can call the shell script via ./yourScript. It should print "Hello, world" to the console. The following is an example how to recursively rename all files called "article.xml" to "001_article.xml" from the current home directory. systemd is used as Ubuntus default init system. SDKMAN! is a tool for managing parallel versions of multiple Software Development Kits on most Unix based systems. It provides a convenient Command Line Interface (CLI) and API for installing, switching, removing and listing Candidates. It provides different versions for Java, Gradle, Maven and much more. It is super easy to install. To see all available versions of a certain package use the sdk list packageName command. To use a certain version, use the sdk list packageName version command. To change the default, use sdk list packageName version. The ssh command provides secure, encrypted access to a server. Use ssh IP-address or ssh your_hostname to access the server. To upload your public ssh key which allows you to login automatically into a server use the following command. You can also assign a shortname for an IP address via the config file in your ~/.ssh directory. For example, to create an alias called foo for the IP address 144.76.74.162 and to use the user called testing switch to your ~/.ssh directory, create the config file if it does not exists and enter the following. Tmux allows to run multiple command line sessions that continue to run even after you log out from SSH. You can later connect to them again. To detach from your current session press kbd:[C-b d]. Your session will continue to run in the background. To scroll in tmux use kbd:[Ctrl-b+ . Now you can use the normal scroll keys to scroll. Press q to quit scroll mode. You see all listeners on your machine via the following command. Port which listen to 127.0.0.1 cannot get accessed from external. netstat -anltp | grep "LISTEN"
Ubuntu provides a uncomplicated firewall (ufw). To install it and only allow SSH, FTP, and webtraffic use the following command. The following commands give you an overview of your network connections. In case you want to send out emails from your PHP sites you have to configure an email client. A simple one is exim4, a setup description can be found under the following links: https://help.ubuntu.com/community/Exim4 and https://wiki.debian.org/GmailAndExim4. Here is an example /etc/exim4/update-exim4.conf.conf file. You need to enter valid user credentials in the passwd.client file in the following format. Afterwards you need to enable the new configuration with the following command. The log files are located in /var/log/exim4. curl is a command line tool to issue and receive http (and other) request. For example, if you want to see the HTTP output of a webpage, use the following command. If you want to the HTTPrequest header (including the HTTP status codes, use the following command. This is for example nice to see if your server delivers a 404 return code for your self-defined error page. You can set HTTP header information with the -h flag. For example, to request a certain MIME type use the -H’Accept:MIME' option. To use curl behind a proxy. If you are using Microsoft Windows, see curl for Windows. For IRC communication you can use the tool xchat. To install it, use "sudo apt-get install xchat". For FTP access you can install filezilla via sudo apt-get install filezilla or map the ftp access to a virtual device. To map the device select your desktop. Select the file menu and the entry "Connect to server". To install an easy to use and configure ftp server use the following command. For a description of MySQL and its installation in Ubuntu see MySQL - Tutorial. Contains default settings for tomcat. Most important the used java version (jdk). The "pdftk" command line tool allows to rework existing pdf files, e.g., extract pages or change the orientation of the pdf file. You can install it via the following command. For example, to extract pages from a pdf document you can use the "cat" option. If you have LibreOffice installed, you can convert .odp files on the command line to pdf files. ImageMagick allows to convert images in batch see ImageMagick Command line Options. For example, the following adjusts the DPI size of images to 300.
byzanz allows to record a specified area on the screen with different output formats and custom settings. See byzanz command line options for details about the usage. The following example creates an animated output.gif file of the screen in the area of (x=0, y=0, width=800, height=1024) with the duration of 20 seconds. Besides the gif format also flv, ogg, ogv and byzanz formats are supported. The command line tool hunspell allows you to check the spelling of a document. For example, you can check an XML document written in English called "input.xml" with the command. The following trigger an interactive session for spell checking. With (i) you can add a word to your local hunspell directory, which is located in your home directory under .hunspell_en_US in case you using the US en checker. You can also check all words in a batch mode with the -l parameter. To connect to your Linux system via telnet or via ssh from Windows you can use putty. In case your Linux system is running under a graphical user interface (KDE, GNOME, …​) and you need access to the console, use the kbd:[Ctr + Alt +F1] shortcut keys to switch to the first console. To switch back to Desktop mode, use the kbd:[Ctrl + Alt+F7] shortcut keys. The default program for creating a bootable USB disk is Startup Disk Creator. This crashes frequently during the creation of a boot disk. The program unetbootin is much more stable. You can install it via the following command and start it on the command line. The x2go server allows to install a X-server on a remote server and access it via a client from a different machine. More information can be found on http://wiki.x2go.org/. 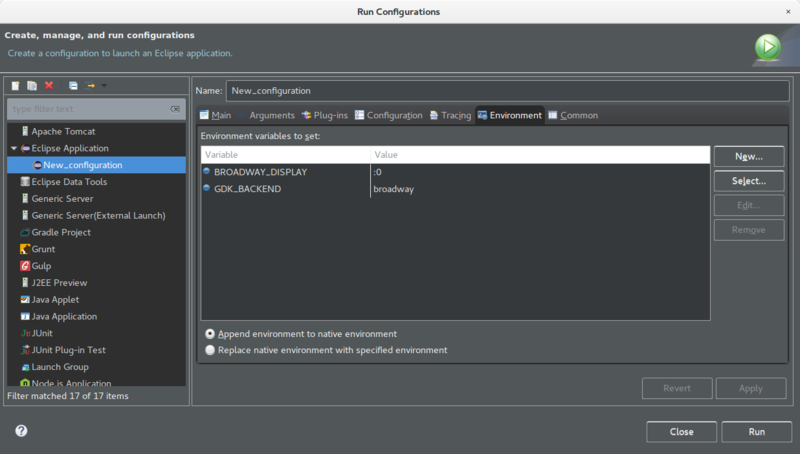 This section describes, how you can display the Eclipse IDE or any other GTK+ application in your web browser using the GDK Broadway backend. In order to display Eclipse or any other application in your web browser, you need to start a Broadway server which comes with GTK+. If you want to set a specific port, just append :offset. The default port is 8080 and as we chose 5 as our offset, the actual port is now 8085. You can now open your web browser and go to http://localhost:8080 (or 8085) and see your application running. If you started your Broadway server with a port offset, just replace :0 with your selected offset. You can now open your web browser and go to http://localhost:8080 (or 8085) and see Eclipse running.